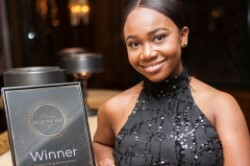 We asked Joyce Dadzie, Legal EA at progressive firm Axiom and winner of the Outstanding Achievement award, to shine a light on her career thus far and give us a rundown of the glamorous awards ceremony. Q: How did you become an EA? A: During my time at Transport for London as the Business Admin Team Lead, I took a secondment as the Executive Assistant to the Chief Information Officer. I have always been the “organised one” amongst my peers and came to realise that the role of an Executive Assistant not only suited my personality but was a role I could thrive in. The excitement of having to juggle so many things at once and the delight in completion of tasks and successful events really keeps me going. After the secondment, my career as an Executive Assistant has gone from strength to strength. Q: What’s great about your job at Axiom? A: The moment I joined Axiom, I knew I would love it. The atmosphere in the office and the culture of the organisation is what makes it so great. It really is a work-hard-play-hard environment and there is always such a good buzz in the place. It’s in the legal sector but nothing like a traditional law firm. My role supports two Executive Vice Presidents and a Senior Vice President spanning across multiple continents and time zones. Each one has different requirements from me at any given time, making no two days the same. Q: The judges said that one of the reasons you won the award is because you have redefined the EA role, taking on CSR work and leading outreach projects. Can you tell us more? A: Recently, Axiom partnered with Enabling Enterprise and was part of their “Ace Advocates” programme, giving students the experience of a business environment and learning “core business skills” such as team-working, problem-solving, debate and leadership. We welcomed twenty-five Year 5 students into the office and encouraged all students to get involved to make sure they all got maximum benefit from the day. It was a great chance for children to work with adults who aren’t teachers and see a professional working environment. Students worked on different cases, either as the defence or prosecution. Some of the cases were Goldilocks on trial for breaking and entering or Robin Hood facing charges for armed robbery! At the close of the day, they presented their evidence to a judge and jury made up of myself and other volunteers who decided the outcome of each case. I spoke to students and aided in their understanding and learning of how I use essential skills in my role, particularly focusing on the use of problem-solving and presenting and explaining how broad the role of an Executive Assistant is. It was such a great experience helping prepare students for the world of work and even more so when some of them said that they would love to do my job. Considering they came to visit a company that provides tech-enabled legal services, I’ll take that as a win! Q: What’s your secret to being organised and juggling lots of priorities? A: To-do lists! Honestly, I love a good list. Not only does it help keep me on track with all my tasks from the start of the day, it provides great satisfaction when I get to tick things off as complete at the end of the day and ensures nothing has been missed or forgotten. I also write a to-do list at the end of each day in advance of the next, so I can come in in the morning and get the ball rolling. Q: Is there a tool or app that you couldn’t live without? A: Outlook. My whole day revolves around emails and calendars. Having the app on my phone means I can keep an eye out for any last-minute changes and the all-dreaded diary clash or cancellation. Q: How did you find the interview for the Outstanding Achievement Award? A: The interview was more of a chat about my career. It was very relaxed, and felt as though I was talking through my accomplishments and my journey. I thought the gods were frowning on me when the fire alarm sounded in the middle of my interview and the whole building was evacuated, but we just went back into the office afterwards and continued chatting. It was such a calm process – referring to it as an interview just doesn’t seem right. Q: Tell me about the ceremony itself? A: The night was amazing. It started with a champagne reception where we got to network and mingle amongst nominees, nominators, recruiters, managers and sponsors. We then sat down for a lovely three-course meal before proceeding to the award presentation. Hearing what the runner-ups and winners had achieved throughout their careers was simply amazing. There was such a high level of talent in the room that simply listening to the nominees in the other categories motivated me to do more. The night was truly a celebration of PAs and EAs and the tremendous work that they do, and being at The Ivy just topped it off! Q: How did your colleagues react? A: I never really told anyone about the awards night beforehand, as I didn’t want to jinx anything. On the day of the awards ceremony, we had an office-wide meeting which was scheduled for the end of the day. By the time I was dolled up and ready to head to the awards, many of my colleagues were still in the office. They of course wished me luck and by the time I returned to work the next morning they all knew I had won an award! I was greeted with hugs and congratulations aplenty. I was given a shout-out at our Monday Morning Pipeline meeting and presented with a bottle of champagne and a box of chocolates. Q: What piece of advice would you give others for achieving success as a PA or EA? A: I have three top tips for anyone that who would love to enter the wonder world of being a PA or an EA. Be Organised. Being organised and on top of things will be a saving grace in this role. Be Prepared. Plan ahead and stay ahead. The more you plan, the less you stress. Be Flexible. No matter how organised you are or how much you’ve planned, the unexpected will always occur!